When I am drinking tea I am usually far from referee's state of mind. I do not drink tea to find the best one but rather try to cultivate myself through the leaf. In this spirit, side by side testing here is not about looking for the winner in intransigent fight. I like how it force my senses to be focused. It is like sitting in dark forest, listening to all sounds around, trying to softly emphatize to all those stories out there. But here it is not about hearing. Taste, smell, feelings in our mouth, throat and our body are things which count. Three samples from Bulang villages were gifted by friend Peter of Pu-erh.sk. I did not remember with what storie were those leaves given to me. And I think this is for best. Three bags with nice chunk of cake in each. Ji Liang, Man Nui and Man Xin Long are names of villages as I read them out. All with 2013 label. I thought that it would be interesting to take pictures of each, wet leaves, first brew, second brew...till left over leaves. But during the session I have realized how pointless it would be. Leaves are very similar, brews with slight variations, even if I have them in front of me live I can not tell which one is which and why. Differences are there but impossible to take a snap of. Leaves are grey green, in all three cases with hairy silver leaves mixed with dark green ones. Leaves are rather big, with maybe just one piece of stem for 10g of tea. 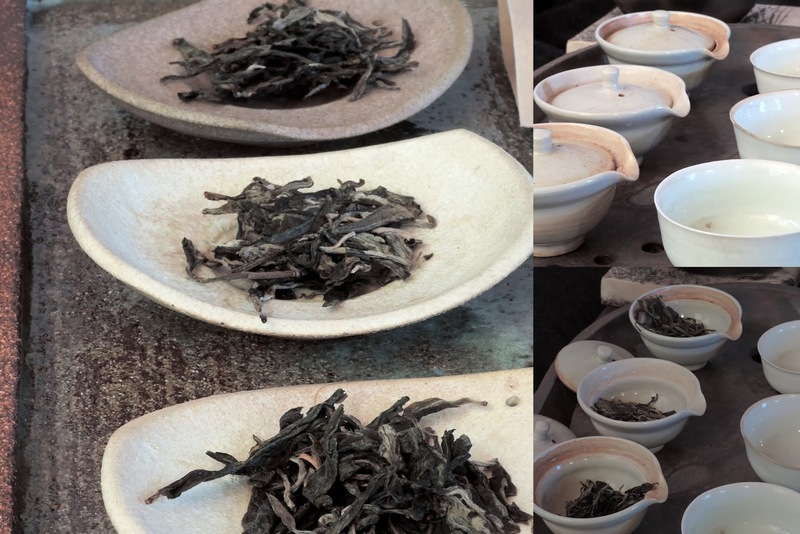 All three samples looks clean and smell as fresh sheng from south west of Xishuanbanna. Heavier tones of citrus fruits, flowers and even chocolate. After rinse, I spent quite a while with smelling, nose deep in my small shiboridashes. Man Xin Long was the strongest, heaviest in this point. Even after this "smell chapter" I knew: Three times 3,5g of such leaves will be quite an experience, especially for my morning empty stomach. But there is no way back now! After first two brews I made some notes and all further cups just confirm those findings. All three teas share basic characteristic of good forest Bulang. Pungent smells, strength, bitterness. It starts shortly in second brew and keep going much longer then one morning driker can take. Brews of of Man Xin Long was darker whole time, strongest guy. Ji Liang shows what I appreciate most: purity and sparkle like feeling in mouth. Just Man Nui was a little bit watery. Maybe without side by side comparison I would not notice. But with the same amount of leaves, brewing method and time, brew look a bit cloudy and taste was a bit watery (when bitter and strong). I would be curious to hear what makes that difference. Less sun during withering, bad weather? After maybe six infusion (3*6=18 cups of strong bulang leaves, don't do it on empty stomach!) I give it a brake, return to my tea table in late afternoon. One warm up/wake up brew and teas give another four, five rounds. It was still good! I decided to visit Pue-hr.sk eshop to check prices, availability or any other informations. But unfortunately, any of those teas are there. Writing directly to Peter, I got quick answer. And pretty interesting. All those teas come from last year spring trip to Bulang, where Peter met with TwoDog of White2Tea (If the Bulang material in that "New Amerykah" cake is as good as those samples, I have to try it!) and Eugene of TeaUrchin. They pick some moacha which they like and TwoDog had let press some cakes, just for themselves. Reading this answer I have recalled one very interesting Eugene's blog post from last spring. Enjoy the reading, down the article you can find more of the story. And stealing Eugene's picture, here they are: Three Tea Musketeers. Tea connects people, that is (among others) what I love about that plant. At the end, lets play some music...When I was about to be slowly defeated by power of those teas, my thoughts were: It is killing me, but It is killing me softly.